ITV unveiled its new on-demand service yesterday, and the first offering was last night’s Champion’s League semi-final between Liverpool and Chelsea. While ITV is currently offering only Champions League football coverage through broadband, it plans to offer all of its programming through the website within the next few weeks. Its on-demand service will offer any programme broadcast on any of ITV’s channels during the previous 30 days – more than the BBC’s 7 days. It will also offer live streams of all of its channels, as well as making its archive available for download. 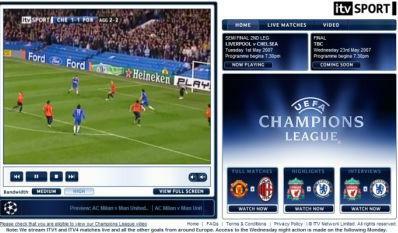 The the full on-demand service is not available yet, but ITV streamed coverage of the Champions League last night. Having watched streaming football coverage on other sites, and being frustrated by poor quality video, ITV’s coverage compares favourably. I watched the whole match though itv.com last night, and the quality of the streaming was excellent, with only the occasional glitch, though the quality suffers slightly when you watch the match in full screen mode. The only problem with the service is the pricing - an annual pass for all ITV’s live matches is £19.99, or you can purchase a 36 hour pass for £1.99. This is fine, but when you can watch the match free of charge on your TV, why would you bother? Not one this year’s semi-finalists appear in the top four – Liverpool are the highest in fifth spot, Man Utd are sixth, Chelsea are eleventh whilst AC Milan are out of the top 16. Inter Milan and Juventus lead the way – reaching 8% and 6% respectively of their domestic online sports audience. In addition, Juventus has the highest domestic unique audience of any club in Europe (420,000). Meanwhile, in the ‘online Premiership’, the top four are the same as the current Premiership top four – Liverpool, Man Utd, Arsenal and Chelsea. Google has been looking into web-based malware and has come up with some worrying figures. Of the 4.5m web pages it looked at in depth, 450,000 were capable of downloading malicious code without the user’s knowledge. A further 700,000 web pages in Google’s study contained code which could potentially compromise a user’s computer. Property website Nestoria is set to launch a version of its vertical search engine in Spain. The audience for online newspaper sites in the US is growing at twice the rate of the overall web audience, according to new figures. The Nielson//NetRatings report, released by the Newspaper Association of America (NAA), also suggests that visitors to these sites have higher incomes, as well as being more inclined to shop online.